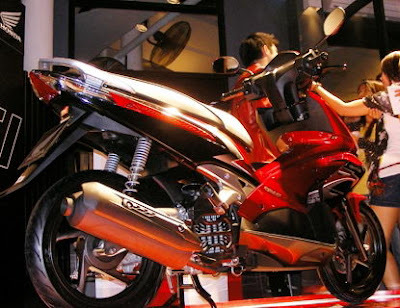 The latest Honda motorcycle in the Thai domestic line up to get the PGM-FI (fuel Injection) upgrade is the Honda Air Blade. At first glance, the new and stylish Honda Air Blade i looks to be no much different than his none fuel injection brother in the range. This doesn't change when you site on the bike as the lightweight and compact dimensions give little indication of the true engine capability. But twist the throttle, and rocket off you go, pin the throttle back and it soon becomes apparent which machine you actually on. The Honda Air Blade PGM-FI really does lift its skirt and get a move on. The 108cc liquid-cooled SOHC single-cylinder four-stroke engine, equipped with the latest on fuel injection and electronic ingestion and fuel control systems making the ride both fun and very rapid. The engine is both torquey and revvy, making the most of any available acceleration. With its well designed and proven frame design, well-controlled suspension and perfect balanced rubber, the chassis is tight and accurate through bends. With Honda's Combi-brake technology, the stopping department not only matches this fine handling, it surpasses it. On the fuel consumption, the Honda Air Blade i with PGM-FI uses about 15% LESS fuel then it the Honda Air Blade equipped with regular carburetor. The Honda Air blade i with PGM-FI is not only better in fuel economics, the performance is so much better, and during this all producing 80% less dangerous exhaust emissions. 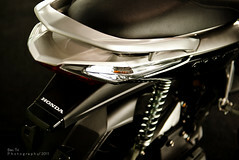 Honda claims that you would save per year, being a average rider, more then 1,500 Baht per year. Also Honda claims that the new improved Air Blade i engine need less service per year. 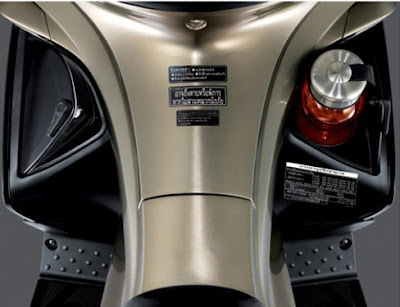 The new for 2009 Honda Air Blade i with PGM-FI (fuel injection) system comes in the color combinations; model NC110AM has "White-Red Deluxe" and "Black-Silver", and model NC110AP has the colors "Precious Golden Brown" and "Rubilize Red". 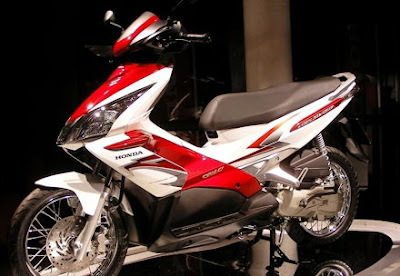 The main difference between the Honda Air Blade NC110AM and NC110AP is that the NC110AM has spoke wired wheels and the NC110AP has light weight aluminum alloy wheels.